This is part 2 of a three-part series describing text processing and classification. Part 1 covers input data preparation and neural network construction, part 2 adds a variety of quality metrics, and part 3 visualizes the results. In part 1 we did the bare minimum to create a functional text classifier. In the real world, we like have multiple indicators of performance. This post will demonstrate how to add more extensive measuring and logging to our model. Full code described in this entry available on GitHub, in dbpedia_classify/tree/part2. Every model has parameters. In addition, we often have training parameters (such as batch size) which may not be directly part of the model but are nonetheless important to record. When prototyping it’s convenient to just fiddle with the values and not necessarily store the results, but at some point it’s time to keep records. Sacred makes this reasonably easy. The ex object has to be declared before any of the decorators can be used. """Default configuration. Fixed (untrainable) word embeddings loaded from word2vec"""
""" Load Google word2vec but allow it to be trained """
Note that the configs must be defined in the correct order, default in the beginning and overwrites happening later. Parameters must named the same thing in the function input and configuration, and so are effectively global. Since they are configuration parameters this makes sense. Occasionally I think the best name for a local scope isn’t the same as the global scope (e.g. witness num_outputs and num_classes above) so that becomes tricky. Providing some positional arguments looks super weird but apparently works. We provide vocab_size as a positional argument, since if a custom vocabulary is generated it’s not known until runtime. """main function body here, similar to part 1"""
@ex.automain def main_func(max_input_length, batch_size, batches_per_epoch, epochs, loss_, optimizer_, _config, do_final_eval=True): """main function body here, similar to part 1"""
The parameters added to the function declaration then become part of the namespace, otherwise we could only access them via calling a different @ex.captured function. Alternatively, they’re avalaible in the _config dictionary, but according to sacred that could be removed at any time, so be warned! Keras makes a certain set of common tasks extremely simple. Like many libraries which that philosophy, as long as we stick to Keras’ strengths everything is great. As soon as we try to venture off the beaten path, it gets thorny (pun intended). In the last post, the only metrics we had were categorical_accuracy and categorical_crossentropy, the latter also being the loss function we were minimizing. Generally I like to have as many metrics as possible; they’re usually redundant but sometimes interesting patterns show up in one that wouldn’t show up in another. Plus, the loss function is a great one to minimize, but the absolute value has no meaning. One useful multi-class metric is the Brier Score. We use the modified Brier Skill Score used by Tamayo et al . In essence this score ranges from 0 to 1 and measures the performance of the predictor over and above what is expected by chance. If a coin-flip predictor is right 50% of the time it gets a Brier score of 0.0, if it’s right 100% of the time it gets a 1.0. Further, it includes the confidence of each score, so the predictor is penalized more strongly for being overconfident when wrong. Conceptually it’s similar to cross-entropy, although having it on a fixed scale of [0, 1] makes the absolute value easier to interpret. is the largest probability, and hence the probability of the predicted class. is the number of classes. 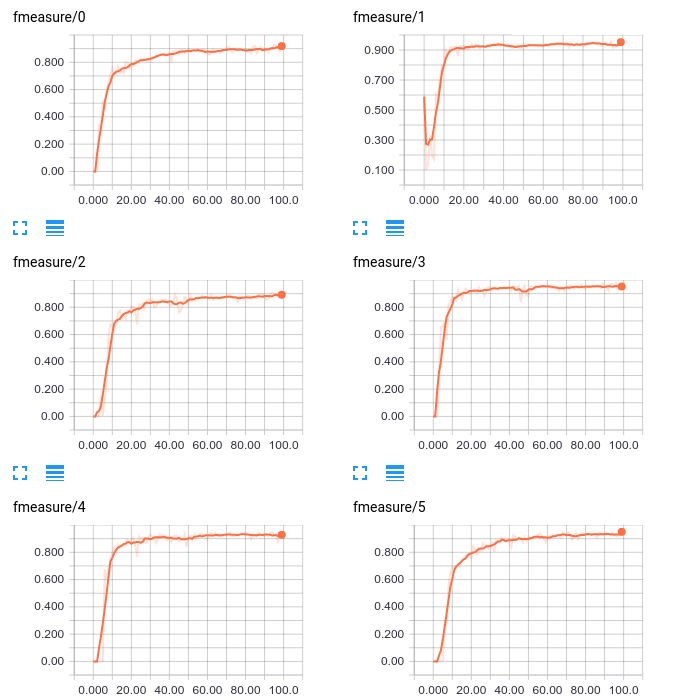 Version 1.2 of Keras included pre-built functions to calculate the precision, recall, and F-measure  of a binary classifier. Weirdly, these only worked one batch at a time and would be averaged over an epoch for a final score. Thus for a user measuring performance, what was reported as “precision” was really “average precision over all batches for this epoch”. Probably due to user confusion, the developer decided the best course of action would be to remove these metrics in Keras version 2.0. Only computes a batch-wise average of precision. how many selected items are relevant. But wait, what’s all this nonsense about binary metrics? We’re dealing with 14 different categories here! Therein lies one reason N-category classification is much harder with N >= 3 than with N=2. There aren’t many multi-class metrics. I’ve got accuracy, cross-entropy, and the Brier score…and that’s it. Here we’re dealing with 14 classes of approximately equal size. If instead we had 1 category which was much larger than the others we could achieve high values for each of the previous metrics just by picking the most common category all the time. This problem has been known for a long time, and the solution is to use metrics like precision and recall on each class. We just need to reduce our 14-category problem to 14 binary (aka “one vs all”) classification problems. """Create a binary metric using `metric_func`"""
"""Create precision, recall, and fmeasure metrics. Log them directly using tensorflow"""
The make_binary_metric logs both the scalar value (one for each class), as well as a histogram of the total. Since y_pred is a matrix of probabilities we first convert it to one-hot predictions (taking the largest value as the prediction). Then we use make_binary_metric to log each metric, feeding in the function (defined elsewhere in custom_metrics.py). 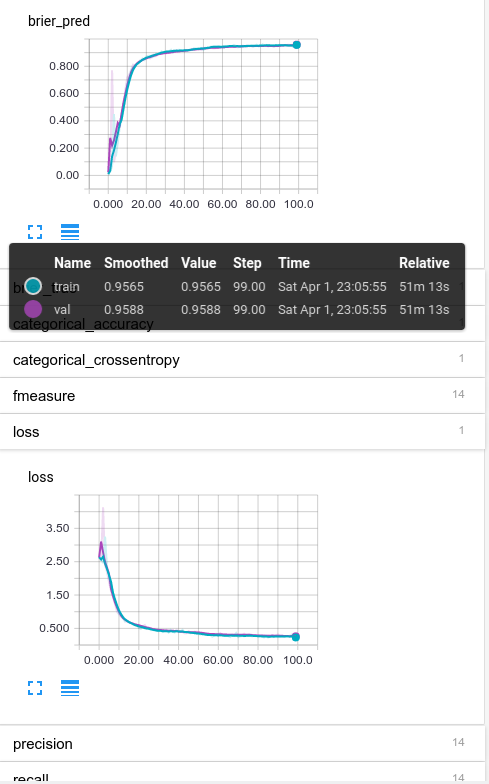 We wrote our metrics directly using the Tensorflow API, rather than Keras. As a result, we need to do a little extra work to actually write out these logs. wasn't logging all the variables I wanted """
This writer only logs the validation data, so we need to make sure and provide some. Having the same validation data each time would not have been my first choice, but it’s the most convenient to program. We will evaluate on a larger dataset at the end. We don’t have the average-over-batch problem described earlier, since our validation set is evaluated all at once. That is, the “precision” being logged will be the precision taken over 1000 validation samples at the end of each training epoch. We also create a class called FilterTensorBoard to help separate the training and validation logs. Keras just adds “val_” to the beginning of everything, which is okay, but Tensorboard works better if each set of logs is in its own directory. FilterTensorBoard takes in a regex pattern of metrics to match and saves the matching ones. So we can create two loggers, one which logs “val_…” and one which logs “(everything not val_…)”. This will give us three loggers in total; one for training metrics (FilterTensorBoard), one for validation metrics (FilterTensorBoard), and the third for our custom metrics (TensorBoardMod). We use different logging directories for each to keep them separate. Now we’re ready to roll! First lets take a look at a training run using our default_config. We are using pre-trained word-vectors from Word2Vec, as well as their vocabulary, and not performing any additional training. I’ve expanded the brier_pred plot and the loss (which is categorical crossentropy in this case) so we could see the performance curve. The main thing to notice is that the training (blue) and validation (purple) curves are right on top of each other, indicating we aren’t overfitting. So that’s good. We also see that the shape of brier_pred and loss are similar; meaning the algorithms self-confidence (brier_pred only looks at the predicted probabilities and not actual ones) matches the real ones reasonably well. Also good. Finally, take a look at the performance mousover states. The final Brier scores are ~0.96, not half-bad! We see that most classes start roughly at 0, except class 1 where it starts close to 0.5. F-Measure is the harmonic mean of precision and recall, presumably a starting point is just predicting everything as one class. As the model learns, the performance becomes more even. Performance on each statistic varies from 0.8 – 1.0, so we aren’t wildly off-base on any particular class. Pre-specified word embeddings and vocabulary, and also allow additional training of the word embeddings. Jumping off the shoulders of giants, as it were. We see that Model 2 has the best performance, although the differences are slight. Intuitively this is to be expected; the pre-trained vectors make use of an enormous corpus of text, but it can still be fine-tuned for this purpose. Model 3 is the fastest to train, since it has the fewest free parameters, and still achieves good performance. We have learned how to log both the inputs of a model (Sacred could be used for any computational experiment btw, not just machine learning) and some hacks which can improve logging using Keras and Tensorflow. This post has largely showcased the downside of using a library like Keras. While it makes some things extremely easy, anything out of its scope becomes much harder. Next time we’ll do something a little bit more interesting, and look at methods of visualizing the textual content itself. Stay tuned! This entry was posted in Machine Learning and tagged text-classification, tutorial. Bookmark the permalink. Its very informative article. Thanks for sharing with us. Thanks for your reply. I am using custom tensorboard saver as callback. Directory for custom has been created but no log file inside it. A physicist by education, who now works in medical research. The opinions expressed here are mine alone.